Hearing loss is a silent epidemic affecting millions of Americans each year. More than half of adults over the age of 50 have some degree of hearing loss. Studies have shown that untreated hearing loss is linked with social withdrawal, isolation from loved ones, depression, and even cognitive decline. Almost 35% of dementia cases are linked with nine different risk factors, including untreated hearing loss. With a hearing loss, listening in difficult conditions such as background noise requires the use of multiple cognitive resources, otherwise known as listening effort. This can lead to fatigue, lack of mental focus, and even poor short term memory. The negative side effects of listening effort have been known to lead to increased difficulty with speech understanding. In the end, this causes many individuals to “tune out” or disengage from socializing. But why is this important? Participating in cognitively-engaging behaviors, such as socializing with friends, is known to slow the rate of cognitive decline in older adults. 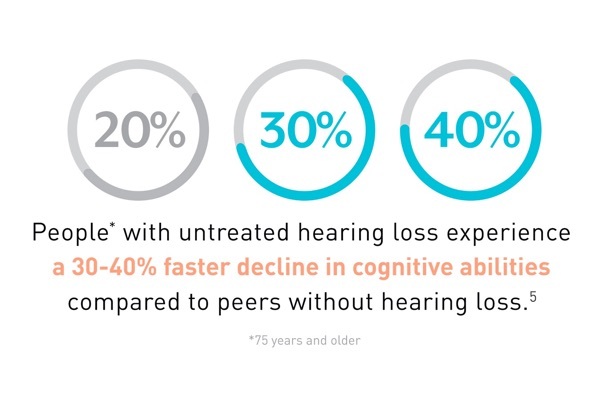 Thus, the rate of cognitive decline may be negatively impacted by untreated hearing loss. So how does one know if they have a hearing loss or need hearing aids? Ask yourself these questions: Have you ever noticed how challenging it is to listen in a noisy restaurant? How about having poor cell reception, talking in the car, or even trying to have a conversation with your significant other while doing the dishes? If these questions are hitting home for you, then it is recommended that you have your hearing tested. Treating a hearing loss with properly fitted and programmed hearing aids leads to less effortful listening. In turn, this leads to less cognitive resources being used, which may help slow the rate of cognitive decline. Treating a hearing loss earlier in life may actually reduce an individual's chance of developing dementia by about 20%. In addition, you will find social engagements and spending time with family to be more fulfilling. Don’t let a hearing loss pull you away from the people and the activities that you love! Stay active, stay engaged, and stay on top of your hearing health!